I didn't take a thermometer, but it must have been 20oC easily. Sunny all day. This was my first trip with the University of Waterloo Outers Club. We did a short day hike to a part of the Bruce Trail just north of Dundas Ontario, at the Spencer Gorge Wilderness Area and Webster's Falls Park. The trail leads to two different sets of very nice waterfalls. The first, Webster's Falls, is a very pretty set of falls. It is approximately 21 metres tall. The only reason I'm posting the journal is to show some of the amazing pictures that I took! I'm not a very good photographer, so these impressed me! If you are a photographer, this would be a nice place for a short day trip. The trail around the falls is quite steep. It's also slippery as a result of spray coming off of the falls. Be careful with your footing here! (Especially when you're looking through a camera!) Beside the main falls there's also a much smaller cascade coming down. 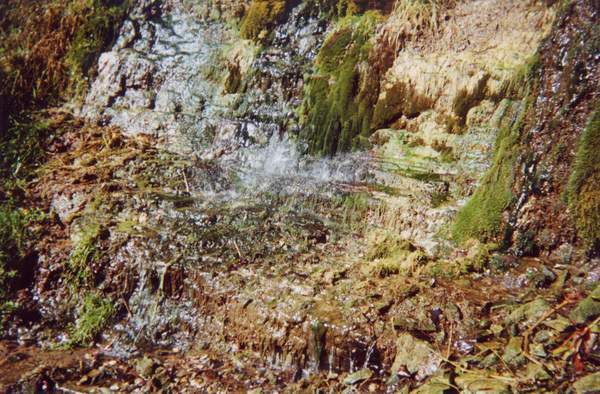 It's got soft moss growing on the cliff wall, with water falling down in front - very nice for pictures! 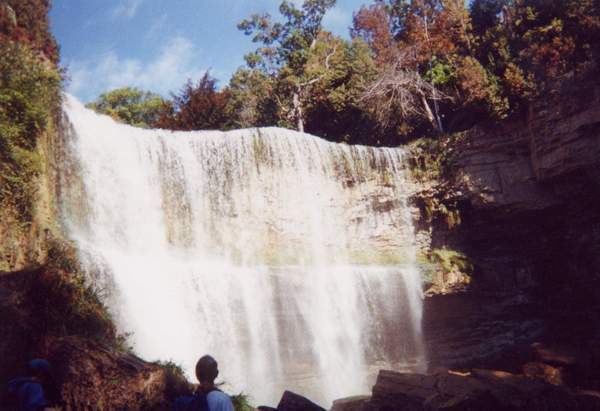 Approximately one kilometre along the Bruce Trail from Webster's Falls is Tews Falls. 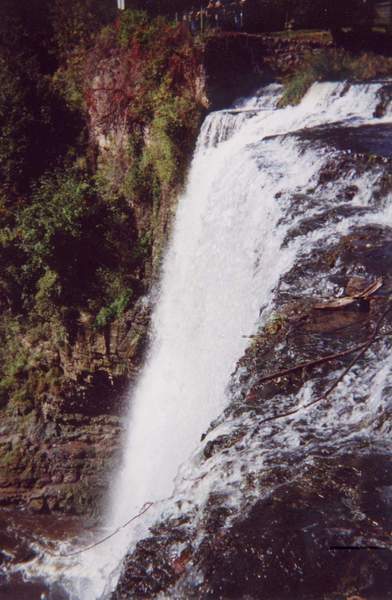 The second set of falls is much higher and narrower. In fact, it is 41 metres tall, which is only a few metres shorter than Niagra Falls. However, there is only a small quantity of water coming over the falls, but it's still quite impressive! Unfortunately I was out of film by this point, so I didn't get any pictures of this beautiful falls. The trails are all quite well maintained. Most of the way is on a well defined gravel path. There are stairs on many of the steep sections of the escarpment. 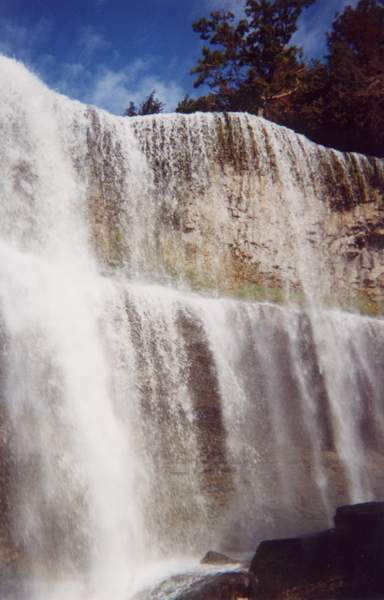 There is a parking and picnic area above Webster's Falls, with large bridges over the water and some manicured lawns and flower gardens. This, unfortunately takes away from the waterfall, as it looks quite pristine from below. This is a shot of Webster's Falls taken from the trail below. The small mossy cascade coming down beside Webster's Falls. Another shot of Webster's Falls taken from the trail to the base. Taken from the bank at the brink of the falls.